You may trash an Estate from your hand for +1%. One of those cards that aims to mess up openings, and not in necessarily a pleasant way! You could open with a 1/5 split, but fortunately, there's a virtual Copper you can afford that'll take those Estates away at no disadvantage! It must have a bit of a weird interaction with Baron, probably mostly beneificially? Finally, a use for 2 of the 10 extra Estates that the base game comes with! Goons/Watchtower doesn't work with double Tactician. Welcome! What do you stream? I'd like to change my submission, Antique has issues as it is. No time to make a picture. Graduate - Action, $3 cost. The next time you gain a non-Victory card this turn, trash this to gain a copy of it. Becomes a copy of the next card you gain, giving a little to making that gain better. Or if you get it while purely greening it stays a peddler. If this doesn't qualify...my bad. This seems stronger than Peddler, not weaker. Unless is has a restriction on what actions it can gain. It might be balanced at with the trashing+gaining optional, which should still qualify for the contest. Instigators is a powerful attack, but like in any instigation-situation you need not one, not two, but three to really make a statement! 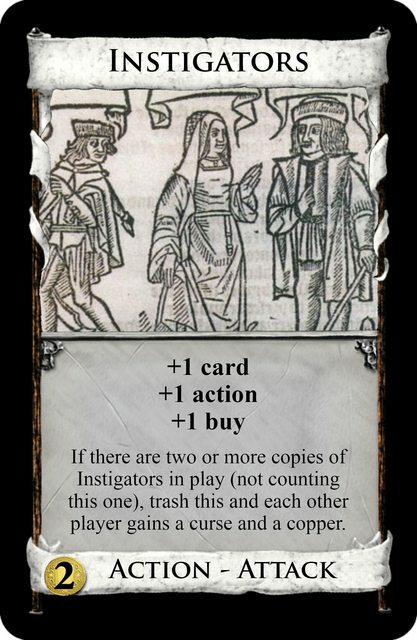 That's why the card is priced at $2; while a +1 card, +1 action card is usually priced at $0, the +1 buy allows multiple copies of Instigators to be picked up and adds to the utility of the card once they're all gone from the supply. If there are two or more copies of Instigators in play (not counting this one), trash this and each other player gains a curse and a copper. Absent any shenanigans from Ball or Summon, you're unlikely to trigger the attack until turn 5/6, which is different from a Mountebank. Also, the fact that you have to trash a copy for the attack means that it's not underpriced IMO. Recommend changing the wording to "three or more (counting this)". It is already in play when you are following the instructions, so it's awkward having a parenthetical to tell you to not count the way you normally would/should. Lots of cards, like all Silver and Gold gainers, are weaker in Platinum games. That’s not a problem. I know. Which means it’s weaker in Platinum games. Just like a lot of official cards are. This isn’t a problem. Does the lose track rule not take care of that? Lose track would stop it from being moved to the in-play area, but not from it being played. It would just get played from the trash and never move. Forgery Fencing could use an "if you do" like Summon. Otherwise it's kind of crazy with Watchtower, and the on-trash penalty doesn't do anything there either. Rules Questions / Re: Necromancing a Mining Village? You cannot trash the card for 2 different reasons. One is that you cannot trash a card that is in the trash; because trashing means moving to the trash. The other is because of the Lose Track rule; Mining Village expects itself to be in play when following its instructions. So when it tries to trash itself; it can't move itself because it isn't in play where it expects. If you Throne Room a Mining Village, you cannot trash it twice (and so cannot get the + twice). Yeah it also reads to me like you should not get +1 action for spending the Villager. Also to be clear, as worded you are allowed to choose the second option even if you have no Villagers; to just use the card as a pure cantrip. But if you do have at least 1 Villager (and 1 card in hand), then a pure cantrip is not an option. I mean, there's always Scheme. Scheme requires you to play the Lep, which means dealing with Hexes and also maybe more Gold than you want. Feedback / Re: Chrome Extension for f.ds! I don't see how it's any different than playing a Smithy as your first action of the turn, and then realizing that you might draw actions that you can't play. When another player plays a card, you may reveal and discard this card from your hand. If you do, they get no effect rather than following the card's instructions. No effect rather than following the card's instructions? Isn't that just the normal effect from playing a card? Did you mean to say "rather" there? I have seen serious suggestions for cards that react to "when an opponent plays a card"; at least one that would cancel the card. I start my Buy phase with 3 Idols in Hand. I play my 1st Idol, given that when you play a card (including Treasures, you 'resolve them as they are played... correct?) and then per card text rule '... When you play this, if you then have an odd number of Idols in play, receive a Boon..., so I would take a Boon and resolve the Boon. So now that I have resolved the playing my 1st Idol and resolved receiving the Boon from having only 1 Idol 'CURRENTLY" in play. And then if I play a 3rd Idol I go back to the resolution that was done playing the 1st Boon. It's not clear what your question or confusion is here... The entire point of Idol is that every-other-one does something different. The first, third, fifth idol you play do one thing, while the second, fourth, sixth idol you play does the other thing. Simply play the card, and do exactly what it says. 1. Yes; you can still play any treasures you drew, because you haven't bought anything yet. Drawing Victory cards is still good because it means they aren't in your next hand instead. Drawing actions is usually worthless, but with things like Villa, or Quest, it can still be helpful. 2. "Discard" always means from hand, unless it says otherwise. Just look at the wording on Cellar, Mill, Vault, etc... they all tell you to discard cards; and none of them specify "from your hand". There's no reason a Boon would be any different. 3. Why would it do any of those things? Cards do what they say and nothing else. Again, your questions can all be answered by simply doing exactly what the cards say, and not wondering if anything has any hidden meaning or functionality. Design a card-shaped object that concerns Silvers. Gaining them, trashing them, getting powers from them, losing powers from them, getting points from them, losing points from them, eating them, whatever! I had to go for the eating option, obviously. *All games of Dominion you play in the future will be played without any cards you ate. But if multiple players are protected from the starve to death rule, how do you deal with stalemates?